I just discovered "Landscape Grass Type" 's. so, apparently these need only be named the same as the Landscape Layer info file and reside in the same folder (sharedassets). and they then control all spawning of objects onto that Landscape Layer. This is pretty cool. my question now would be - is there any difference in end-performance between painting foliage (or anything) this way or letting the material spawn foliage ? so . . . didn't really work so well. copied the Grass Types from FoolsRoad and renamed them and made a duplicate of one. the duplicate Type could be changed (removed all "Grass" and when painted, no grass or rocks - w00t!) - but all the others refuse to be modified - added and removed "Grasses", saved, but when painted, no change. I can't figure out whats going on. I'd like to use the Material Functions and the Grass Types a lot more because they are quite cool, but this has me stumped. Still having trouble with this. I have now made my own Grass Types from scratch. I have added them to the GrassType in my Landscape Material (copied and renamed), and I've got Material Functions (copied and renamed) in place, including the Blend and Camera MF's. Yet still i get the Rocks coming up on the Terrain Material when painting, as shown in the screenie below, even with an entirely different Grass Type attached. Is something holding -over from the Fools Road files I've copied from? Or is it something to do with the Material Functions that i cannot see/access? I really cannot see what I'm doing wrong here. Doesn't matter what the name is. Click on each and find a field on the left that lets you open a tiny content browser. Search for your own materials - the copied ones and once you did this for each node, save the master material file. Now any changes you make to your materials should be reflected when using the custom master material. Second, open the master material again. This time, find the green grasstype nodes. Again they are named after the materials/grasstypes or should be. Again assign your custom grasstype to each node, the same way you did with the materials. PS: It's still a good idea to keep the names uniform, even though they don't do anything - it'll make it easier to find things. If you want it in a bit more detail and in video form aswell, Axton made an extremely helpful series on mapping in Squad. @Peerun: thank you very much for the replies, much appreciated, although i am rather embarrassed about this - seems i missed a few things along the way <Do'h!>. i have my "universal" files for Material Functions, Grass Types and (terrain)Materials, in their own folders, from which i'll be referencing as a library instead of making and renaming copies, for each "map". once i had replaced the existing(old) terrain mat - oh, and i missed changing one grass type, which was the persistent problem giving me false information (as in: i see stuff is still there!) - once those were fixed it all worked properly and i now have the Grass Types working as they should. Well they are quiet, but not THAT quiet. Try using your phone headphones, those are usually less sensitive, higher volume. it's more a case of volume turned up so far to hear anything then there is to much "noise" in the signal to hear correctly - any other vid will blow my eardrums at the same volume. Please a couple of problems I wanna run by you guys if maybe you know the answers. First what would be the best way to make it so INS could drive the Militia camo vehicles? Maybe just change the texture of the INS vehicles and save them off as new assets. I just want the INS to drive the camo technicals and trucks in the Central American cartel map I'm making. Secondly, what's up with the foliage editor on the stock maps once you delete the existing foliage? 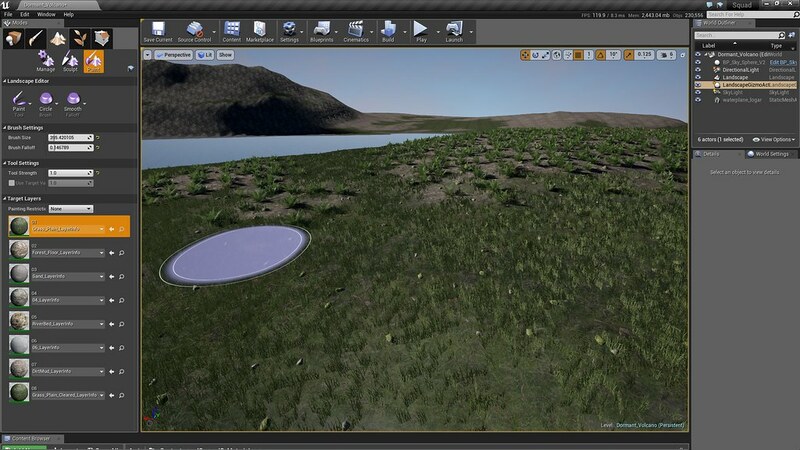 Ergo the map is barren right but I can't paint foliage in at all but then if I like manually drop in a rock, bush or tree and then go back to the foliage editor now the lavender brush appears when and only when it hovers overs those assets and when you click it the foliage only appears on those manually placed objects. So visualize a tree and now it's full of ferns for example. Well when you delete the foliage from the foliage painter there is no foliage to paint. Anyone getting this> ue-35937 error? To explain: I've just added a 10th Layer to my Terrain Material (0-9) and I suddenly get two consecutive editor crashes when trying to apply the new 10th layer. I've found that it is a bug that has apparently been fixed by Epic, but not in the SDK yet, I presume...? Is there an issue with using more than 9 layers in the Terrain Material? Maybe just change the texture of the INS vehicles and save them off as new assets. I would have thought so, although i'd save a re-named copy of the non-camo one first and then work on that copy as your camo version. If there's already a camo version of the vehicle it should be just a matter of swapping out all the relevant textures, surely.? Unless: have you looked into the vehicle BP and stuff - where things like Team Ownership is kept - can't remember just now - pretty sure that's in there someplace. - you could change these rather than the textures - might end up being easier too. You mean, after deleting all the placed instances, it won't let you paint anything back onto the terrain? That's weird, as you only deleted the instances - the foliage (in the list) should still paint per-layer as it was set before you deleted stuff. - your layer hasn't lost it's LayerInfo, has it? - tho that usually brings up an error, prompting you to create a LayerInfo, before painting. ... and when you click it the foliage only appears on those manually placed objects. So visualize a tree and now it's full of ferns for example. This sounds suspiciously like you're allowing Foliage Painting on Static Meshes - it's an option near the top someplace, you need to un-tick Painting On Static Meshes, or some such - i was painting grass all over the top of a house for an entire afternoon until i worked that one out :P.
If it's been fixed in 4.16 then it doesn't apply to Squad just yet. Wait for the new SDK. Terrain Material: not rendered onto some terrain sections: apparently is there, just not being rendered. after breaking something earlier (look above somewhere ^ ) i now have another one. This time i have two(2) adjacent Sections of my Terain that are not rendering the Terrain Material, just showing up as the default chequerboard. I can paint foliage, per-layer, without problem - my foilages go where they should, dictated by the terrain LayerInfo's, but no ground Materials or the Grass Types thereon are being rendered (shown). I have tried refreshing the Terrain Mat and all links therein to all the Mat Functions and Grass Types, to no avail. Wondering now whether somethings gone amiss with the actual terrain mesh? No I have this landscape material with these assets like grass,rocks and ferns attached to it. invisible collision issue. Does anyone have experience with this issue or know how to solve this ? Treid to smoothen the landscape and paint another layer there but the pike won't go. paint all foliage and such with the foliage tool but I prefer to solve it like it should. with the actual terrain mesh? Y'all can ignore this now. I restarted the map from scratch - couldn't work out how to fix it. Did it initially paint correctly? but bug-out later on? had similar problem with my issue (above). Trying to paint Landscape Materials over the effected terrain did nothing. So you're using Grass Types to apply those foliages you show? I figured my error was something to do with the raw Terrain (heightmap, mesh, woteva) bugging out - losing some information someplace - that caused it to not render those Mats onto the terrain. I know it's not the same, but maybe something can glitch the terrain? I'm pretty sure i broke mine by adding a 10th Terrain Layer - this crashed the editor almost immediately (twice) - which seems to have brought about the glitched Terrain Sections. No I use the copied terrain material from Foolsroad to paint the landscape. It contains the meshes like ferns,grass and stones. At one area they go skyhigh like a pike. Smoothen terrain/landscape did not work to solve it. Repainting did not solve it. It just keeps coming back. Maybe I need to make a terrain material from scratch instead of copy one. But I followed this tutorial and it works well except one spot. I originally did the same as you (using FoolsRoad) but had to end up making my own sererate copies(or duplicates) and sets, in my own folder structure. I copied/duplicated and re-named the Terrain Material (Make sure you're using a 'Master', not an Instance) and the Material Functions but made my own new Grass Types (they're the things responsible for auto-spawning your ferns'n'stuffs onto the terrain). I had to make new Grass Types because the existing ones refused to be modified - don't kno why. After copying these things i still had to open them all up and re-name bits for the Material Functions, including Terrain -Camera and -Blend, then make sure the new functions were correctly selected in the Terrain Material, and that all the Grass Types in the Terrain Material were also re-set to the new ones (you will have to make). After that it's just a case of going through your different Materials and Material Functions and changing textures and stuff to create your own Masters. for instance, i now have a small library of Material Functions that i can mix'n'match into my different Terain Material Masters, for my different landscapes. I really do suspect that we have both experienced some kind of glitch that has broken the terrain mesh, or something related to it, causing things to not render(or be placed) correctly, according to the terrain surface. Mine refused to render or accept Terrain Material on two of the Terrain Sections - yours is placing foliage instances onto what looks suspiciously like the spiky reference grid (terrain Sections) you get whilst creating a new terrain. My only fix (i know of, so far) was to re-start the map from the very beginning, re-importing the heightmap, re-applying my existing LayerInfo's but re-importing my terrian masks - this meant i had to re-touch all the painted Terrain Materials to make it look pertty again, but the broken sections were gone. Thanks LaughingJack, so it seems that copy that all might trigger the bug. For this map I leave it but for any next map I will do it like you said. Yeah, i'm not totally sure what's causing it, but other wierd things have happened from Copying Mats before - for me anyway. kind hoping the next update to the SDK will fix some things. @Drecks: might (very, maybe) have found a possible solution to both our problems - did some trawling of the UE4 forums and found multiple posts about issues similar/related to those we've experienced, and it has been an issue for a long time - more than two years, looks like. It is to do with limits to the number of textures able to be rendered (12, apparently, but this includes; Diff, Norm, etc. and also Lighting and Blending textures, and any Masks - so only a few layers could blow the texture limit and cause errors). For others reading this: this is for when you have terrain sections inexplicably decide to go-default and refuse to be Painted or Blended in any way - when "terrain sections break". This> need to change the SamplerSource for your all your TextureSample nodes to "Shared: Wrap" and the problem will go away. is the common answer that is given and has worked for those that posted it worked. - it is also noted by UE4 staff that this is only a workaround, suggesting they might actually fix it properly at some point. Now i've already started again on mine, but you might want to try this out, see if it works on yours (save you re-doing it all). I did it and it seems gone. Not all textures had this setting so I set it all. And it seems gone... Thumbs up for you. Here some link on how to for others with issues. Orsim!! fingers crossed it don't break again. It will as the mappers path is a rocky path.